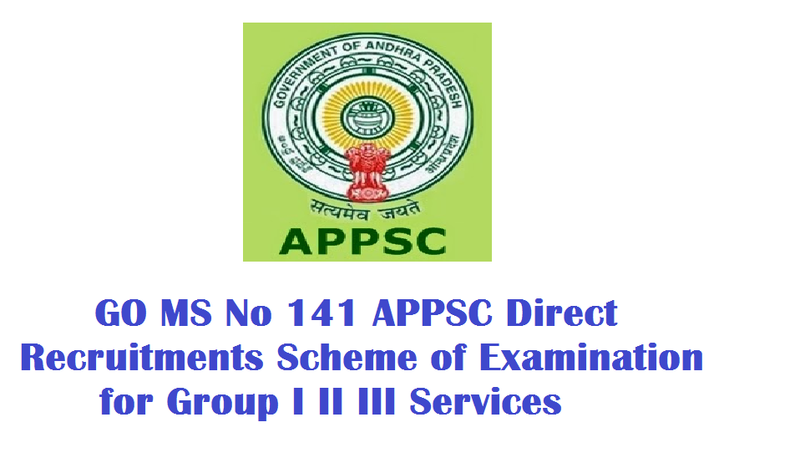 GO MS No 141 APPSC Direct Recruitments Scheme of Examination for Group I II III Services APPSC - Direct Recruitments from Andhra Pradesh Public Service Commission - Scheme for recruitment to Group I, Group II and Group III Services and Gazetted and Non-Gazetted categories - Revised - Orders–Issued. In the Government Order 12th read above orders were issued asking APPSC to issue notification for Group-I, Group-II, Group-III and other Services. In the Government orders 10th and 11th read above, the Scheme of Examination for Group-I, II and III was revised by reorganizing services under Group-IA and IB, Group-II and Gazetted and Non-Gazetted Services. The Government orders 11th read above also prescribed the Examination Scheme for various services. Government of India have issued orders to discontinue interviews for all Group-C and certain Group-B category and equivalent posts vide reference 13th read above. In the Memo 14th Read above Government of India has also listed the action taken by various State Governments which dispensed with interviews for various middle and lower level Government posts. In the Government orders 10th read above, services which are much inferior to Group-IA Services are also prescribed 5 papers of descriptive tests for 750 marks along with interviews for 75 marks by clubbing with much superior Group-IA services. The same order specifies requirement for interview for lower level Gazetted and non-Gazetted posts. The Government have re-examined the requirement of descriptive tests and interviews for lower level posts and in light of the national policy. In the interest of fairness and objectivity and in exercise of powers vested with Government as per Article 320 of Constitution of India and as per Regulation 14A of AP. Public Service Commission's Regulations, 1963 the Government direct that the classification of categories as done in the reference twelfth read above shall be followed for direct recruitment to various posts. Accordingly, the Government also direct that the Scheme of Examinations for various Services be as annexed to this order. For the purposes of this G.O. the Group – I (A) services shall be treated as Group-I services and the Group – I (B) services are to be treated as included in Group – II services specified in G.O. Ms. No.110, dated:17.06.2016 (reference 12th read above). The Principal Secretary, A.P. Public Service Commission shall take necessary action in the matter.